A really unique book, The Shadow of the Wind is a wonderfully complex novel that is simultaneously mysterious, funny, romantic, thrilling, political and suspenseful. Set in Barcelona in 1945, the main story is about Daniel, a young man whose book-dealer father takes him to the Cemetery of Forgotten Books where he finds a mysterious book entitled “The Shadow of the Wind” by Julian Carax. Daniel soon finds himself immersed in the book and the author’s own story, especially when he discovers that a strange figure has been systematically tracking down and destroying copies of all works by Carax. Daniel is determined to protect his own copy and discover who the strange figure is and why the books are being destroyed. Meanwhile, Daniel’s own life is becoming a drama of its own. Multiple characters enter the story, some in relation to Carax, others not, but each has his or her own history to be told as Daniel encounters them, resulting in a novel that is deliciously super-saturated with plot (including surprises and shocking revelations) and a fantastic collection of characters (evil villains, REALLY evil villains, tragic heroes, comic heroes, scapegoats and madmen). The most omnipresent character in the novel was the city of Barcelona itself. The author specifically described areas of the city where the action took place and in the back of the trade paperback version there is a walking tour of the city, pinpointing locations of places mentioned in the story. So close to the end of the Spanish Civil War, the city had a very distinct personality. The mood was unsure and pessimistic, and the setting very gothic, ensorcelled in Spanish mysticism. The writing in this novel is some of the most enjoyably lyrical I have read. The author shows a real passion and enjoyment of language that he shares with the reader. The book is a translation from the original Spanish novel and I think the translation must be excellent, since the writing shines, and the book is rich with both wit and humor. A beautifully written memoir, Brother, I’m Dying is the story of two Haitian brothers who, living thousands of miles apart, share a great love for one another and use that love to cultivate their exceptionally compassionate and supportive family, despite the distance and a number of difficult challenges. 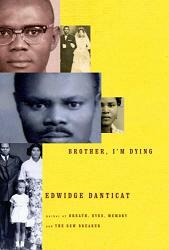 The book is written by Edwidge Danticat, who was born in Haiti in 1969. When she was just two years old, her father, Andre, left Haiti for New York City to find work and make a place for his family. Her mother joined him two years later, leaving Edwidge and her younger brother with Andre’s older brother (her Uncle Joseph) and his wife and family. During her twelve years of childhood in Haiti, Edwidge came to know Uncle Joseph as her second father. At age twelve, Edwidge’s parents came back to Haiti with their two youngest children, whom Edwidge and her brother had never met. They all returned to New York together. Despite the distance, the two halves of the family remained close, and their concern and care for each other are remarkable qualities missing from many family dynamics today. I wonder if their closeness was a characteristic of Haitian culture or of this particular family. While the book is largely about her family and the relationship between her father and uncle, Danticat also discusses the relationship between Haiti and the United States. She incorporates within her story certain facts from 20th century history as they affected her family, especially regarding political unrest in Haiti and the involvement of the United States. As an Haitian-American the author seems conflicted by the changing relationship between the two countries. She mentions both negative and positive effects of U.S. agencies in Haiti and exposes some shockingly brutal facts regarding the treatment of Haitian immigrants in the United States. These facts are always revealed clearly and without sensationalism which I feel greatly increases her credibility. Because the characters are presented by someone who loves them, the reader can’t help but feel love for them, too. It’s easy to cry and laugh with them, be dismayed by bad news, happy during long-awaited reunions and heartbroken during injustice and tragedy. While most of the stories in the book are written from verbal recollections she gathered from members of her family, I found the scenes written from her own experiences particularly compelling. Danticat has written one other work of non-fiction, After the Dance: A Walk Through Carnival in Jacmel, Haiti and four books of fiction: The Dew Breaker, The Farming of Bones, Krik? Krak!, and Breath, Eyes, Memory.